Most famous are the three Ts, or 3Ts of Trumpers, Taylors of Bond Street (TOBS), who are in Jermyn Street, and Truefitt & Hill. 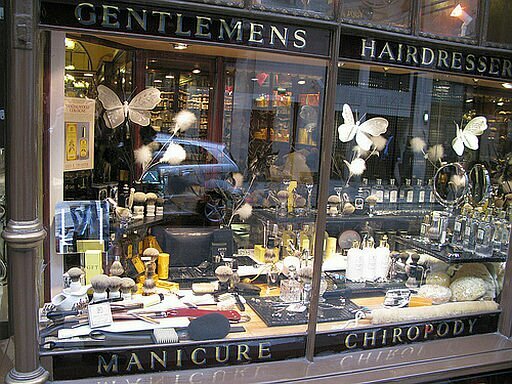 Their small shops hide big businesses that create luxury goods sold worldwide and which are the backbone of the real shaving movement. Everything that these three firms make is analysed in the minutest detail on the shaving forums. And they do make some amazing products. Trumpers Coconut Oil Shaving Cream and their Coral Skin Food for instance are regarded as being amongst the finest shaving products in the world. And they are very cheap. Whilst the initial purchase price is higher than for supermarket aerosol gels, they last so much longer that in cost per shave terms they are a bargain. An almond sized lump of quality shave cream is ample for a three pass daily shave, for instance. Two of these companies do sample bags that you can buy over the interweb. These are very cheap and great fun and just perfect for travelling. The Trumpers sample pack is just £5 with no P&P, it comes in a nice cloth drawstring bag. The contents are supposedly: 6 x Cologne sample vials (fragrances vary), 4 x Shaving Cream Samples, 2 x 8ml Skin Food Samples. In addition they sent me a bath and shower cream sample. The Truefitt and Hill samples also come in a nice drawstring bag. They are £6 + P&P and include: Ultimate Comfort Aftershave Balm, 1805 Shaving Cream, 1805 Aftershave Balm, Trafalgar Shaving Cream, Trafalgar Aftershave Balm, West Indian Limes Shaving Cream, West Indian Limes Aftershave Balm, Grafton Shaving Cream, Grafton Aftershave Balm, Lavender Shaving Cream, Almond Shaving Cream. The three Ts are not the end of the London heritage in quality shaving. There are several more very well established companies. D R Harris are over 200 years old and supply Prince Charles. They are at 29 St James’s Street. Czech and Speake are in Jermyn Street. Their sample are just £2.50 +P&P which is very generous. A Maitland & Co are in Piccadilly. They come from a chemist background. And they don’t have their own website! Floris are a ladies’ perfumery. But they also sell very highly rated men’s toiletries. Penhaligon’s are also a perfumery who make a range of gentleman’s grooming products. They have several shops. So they are all very close to each other, within walking distance. You can buy some amazingly luxurious products. And still be paying less per shave than using supermarket aerosols.